BIG. BIGGER. BEST. 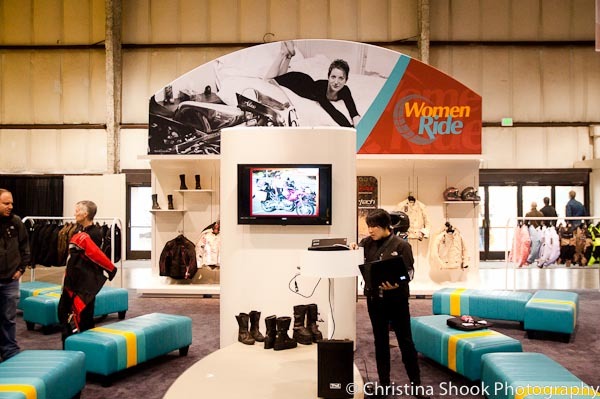 I love seeing my photos so big gracing the Women Ride center at the International Motorcycle show. But best is that the people who run the show put the thought and effort into really improving women’s presence and honored us by having real women shown. BIG photos of my real women bikers set the tone at the women's center. The women center looked great and Joanne Dunn and Sue Slate deserve huge credit, slaps on the back and rounds of drinks bought for them. See Joanne right there setting up the ever aggravating AV. 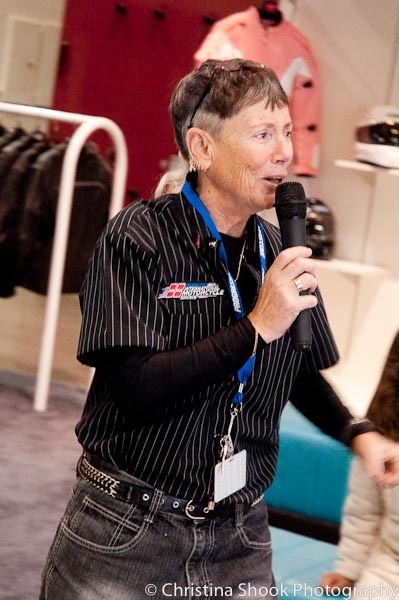 Sue Slate speaks engagingly on any motorcycle topic at all. Sue is a terrific speaker. She’s like a favorite auntie who comes to dinner and can mesmerize the whole family dishing up wise advice peppered with tales of the road. Her relentless enthisiasm to encourage and share information is as well as sheer energy of doing this ALL DAY every weekend in every city is formidable. Here she is showing me how a 5’2″ woman rides a KTM 900. She is a entire foot shorter than me and I find that bike to fit be perfectly. The trick? Custom made SUPER TALL SOLES on her riding boots so her feet can reach the ground. Maybe 3 extra inches there. 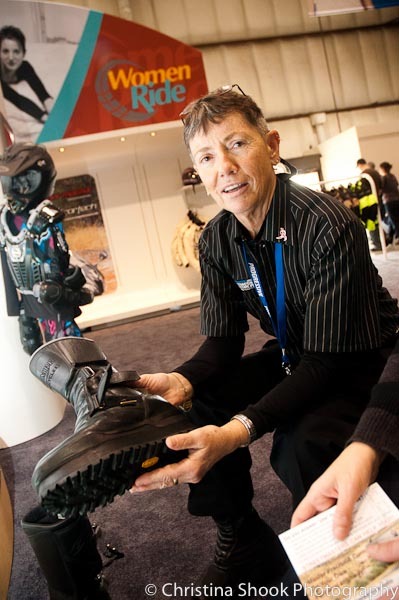 Sue Slate shows her custom made TALL boot for short rider. Here is one of my heros – Elena Myers. Only 17 and the racing queen. 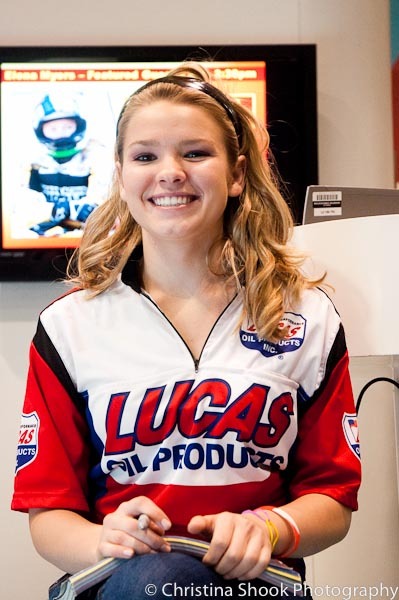 I saw her win last summer at Infineon Raceway as the first woman to win a pro AMA race. She’s a tad bit shy and seems quite modest signing photos while awash in admiration of a crowd of fans. That admiring fan on the right is Lil’ Red Riding Liz and you can check out her blog too. If you’re going to one of the next upcoming International Motorcycle shows, use this online code to get a discount on your ticket: COB (as in Chicks On Bikes, ya know). My very favorite photography site.